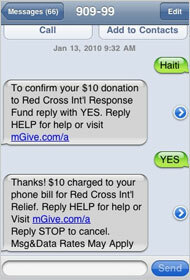 Over $5 million had been raised through text message, thanks to a texting campaign spread on Twitter and Facebook [want to help Haiti people who lost homes, friends and family members in the 7.0-magnitude earthquake? Check-out here]. People around the world also can see the earliest pictures and videos of disaster through TwitPic and YouTube or even satellite photos via Google Earth.